Tired of the Christmas decor you own? Or, did you (like me) have a piece break and become unusable? Never fear! You can repurpose those old decor items into something fresh and new – just in time for Christmas. I had a lovely candle holder, which I used in my Christmas decorating every year. 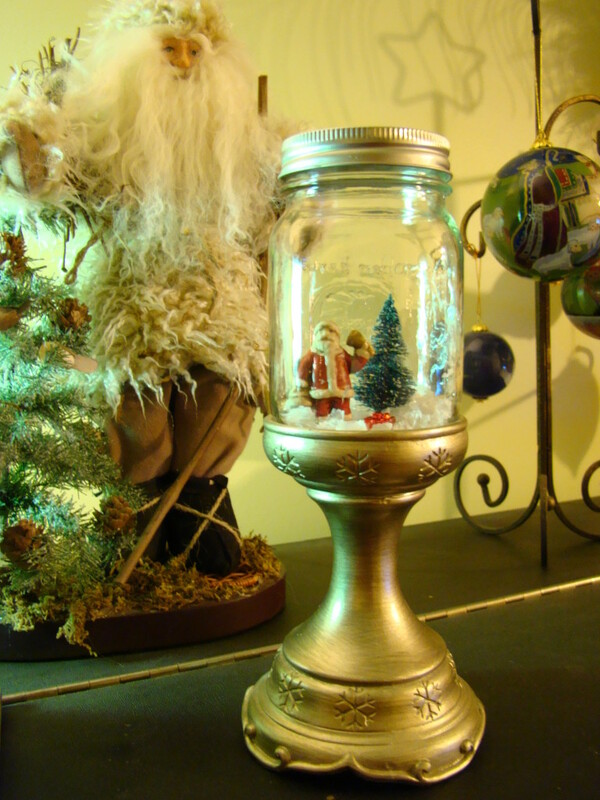 The crackled-glass jar sat on top of a goldish-silver pedestal, and looked perfectly coordinated with my vintage-look Santa, all dressed in white. Instead of tossing it out, I set a pint-sized mason jar on top. Then, I added a small porcelain Santa figure and a bottle-brush tree, along with a teeny-tiny plastic Christmas gift. A bit of hot glue ensured that everything would stay in place. I sprinkled in a little faux snow, and voila! Instant snow-globe-in-a-jar! I added the lid to the jar, covering the top with a bit of wintry fabric to finish it off. Then, the jar was hot-glued to the top of the pedestal. I’m just tickled with how it turned out. I think Santa likes it, too…can you see him gazing at it from the background? I always love a mix of old and new, glitzy and rustic, so this project was right up my alley. Give it a try – with or without a fancy pedestal. You can use miniature Christmas tree ornaments for your figures, or scour the thrift store for some items to create your own snow globe. Enjoy!